VeryPDF PDF to ePub Converter is a command line application which can convert PDF to ePub with reflowable text that is more suitable for small devices like, iPhone, iPad and iPod Touch or others ePub readers. It can also convert Word, Excel, PowerPoint, RTF, TXT, images, and HTML to ePub. In addition, it allows users to set ePub cover, information, text color, background color, page margin, line spacing, paragraph spacing, etc. When converting Office file formats, Office 2007 or later version is needed. 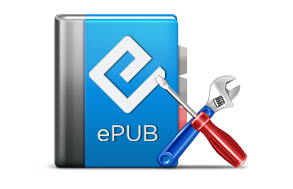 This ePub creator can convert PDF to ePub and other popular file formats including Word (DOC, DOCX), Excel (XLS, XLSX), PowerPoint (PPT, PPTX), image (JPG, JPEG, PNG, BMP, GIF, TIF, TIFF), RTF, TXT and HTML to ePub. The content of the ePub files can adapt to different sizes of screen, which can greatly improve the reading experience. VeryPDF PDF to ePub Converter is capable of preserving the original text color, font size, images, hyperlinks, background color, underlines, strickout, italic, superscript, subscript, etc. in the output ePub eBooks. VeryPDF PDF to ePub Converter allows users to set different options for the created ePub eBook, such as set ePub book information (title, author, publisher, description, etc. ), set page margins, line spacing, paragraph spacing for ePub, etc. What's more, it supports to specify a local image as the ePub cover. 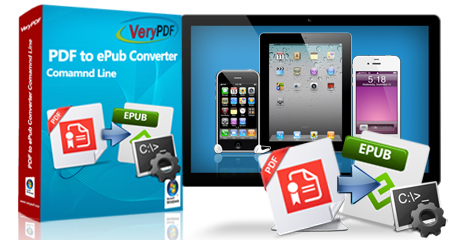 VeryPDF PDF to ePub Converter is also an efficient ePub merger which can merge multiple ePub files into one single ePub for better organizing and archiving. 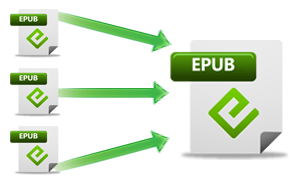 Users can easily and smoothly merge more than 50 ePub files into one at a time. Support various input file formats including PDF, Word (DOC, DOCX), Excel (XLS, XLSX), PowerPoint (PPT, PPTX), image (JPG, JPEG, PNG, BMP, GIF, TIF, TIFF), RTF, TXT and HTML. Option to remain original font size,preserve /change original text color and background color. Option to ignore/ remain images and hyperlinks in the output ePub files. Option to select a local image as the ePub cover. Option to set ePub book information such as title, author, publisher, description, etc. Option to merge ePub files in a batch mode. It can convert owner password protected PDF file to epub directly. And if you know open password, it also can convert open password protected PDF to ePub easily. 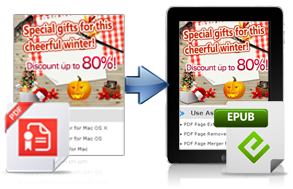 It allows you to choose PDF page range or some page to be converted to epub. It also can convert word document to epub without Office word application installed. Standalone software, it can do the conversion without Adobe software installed. Convert multipage tiff file to epub quickly. 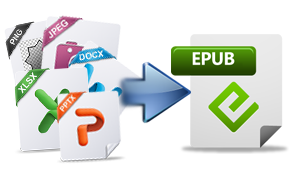 Convert scan PDF file to epub correctly. Difference between a PDF and an EPUB?